Don’t know how to spend your break? Fearful for the impending boredom? 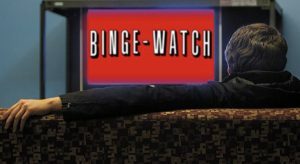 Look no further, I have a solution for you: binge the heck out of Netflix. A new Netflix hit that comes from the same world as the CW’s Riverdale, this show is a remake of Sabrina the Teenage Witch, but sticks more to the darker source material of the comics its comes from. Watch Sabrina Spellman, the half-mortal and half-witch, choose between the light and darkness as she discovers the truths of the magic world. You can’t expect a list of shows to binge without Stranger Things being included. Three boys searching for their missing friend Will in small town Indiana come across a strange (yes I said it) girl named Eleven, who knows where Will is, but it’s not pretty, or on the same plane as them. Think The Goonies, but with a little more drama and creepiness. This is an underrated Netflix creation that after it was cancelled fan uproar brought it back for a 2 hour finale. Eight people across the world, all with different lives and no knowledge of each other, suddenly find themselves able to telepathically communicate. One of the most diverse shows I’ve ever seen in television, with suspense and drama to boot. The 100 is a dystopian future show, but with a new concept: humanity doesn’t inhabit the earth. Humanity is all on a ship named The Ark in space, which deals with population control by making all crimes punishable by death, except for teens who have to wait in prison for their death date. When The Ark starts to fail, all 100 teen prisoners are sent down to the earth to see if humanity can survive on the ground. The fate of humanity unfolds as delinquent teens become the last hope for everyone. This is, in my opinion, the best Marvel show Netflix has created. Matt Murdock is pro-bono lawyer in Hell’s Kitchen, blind and orphaned since a childhood accident. While seemingly harmless, Matt has a secret: he’s the vigilante superhero Daredevil. Three seasons of crazy action balanced with plot so thick you could cut it with a knife. Here’s a pick that’s for fans of cartoons with an actual plot line. In the future four teens and their leader are whisked away from earth to deep to and have to work with two members of a royal alien family to save the galaxy. While it looks and sounds like a kid’s cartoon, Voltron has a lot of plot and conflict that is deep and complicated, making it appealing to teens and college kids such as ourselves. Flashback time! A Series of Unfortunate Events were some of the most popular books when our generation (Gen Z) were kids. After a failed movie it looked like there was no hope for a good adaptation, until this show. The Baudelaire’s are newly orphaned and just trying to find a permanent guardian, but their Uncle Olaf won’t stop chasing them and their fortune. Watch Violet, Klaus and Sunny unravel the mysteries of the past and just what really happened to their parents.